A deal between Amir Khan and Lamont Peterson over a rematch is still to be agreed with the US boxer choosing to wait until an appeal over a demand for a new fight is concluded. A spokesman for Peterson told BBC Sport: "Right now our efforts are focused on the appeal to the World Boxing Association (WBA). "We are patiently awaiting a decision. "Once that's done and Lamont is finally in receipt of his WBA belt then we will shift the focus to who he fights next." Earlier, Richard Schaefer, Khan's US-based promoter, told BBC Sport that Peterson's camp had promised to give an answer over a rematch on Thursday. But it now appears that the Peterson camp have no intention of agreeing to another fight while the appeal is on-going. 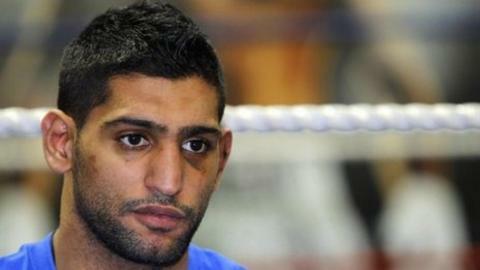 Khan has been seeking a new fight since losing his light-welterweight belts in controversial circumstances last month. The Bolton boxer is scheduled to next fight at the Staples Centre in Los Angeles on Saturday, 19 May, with Peterson topping the list of potential opponents. Schaefer confirmed last week that a new offer to Peterson had been made which would see revenues from the fight shared equally. A statement from Schaefer's company, Golden Boy Promotions, said: "Team Khan would agree to a 50-50 split of worldwide revenues derived from a rematch (including those derived from the United Kingdom) should Mr Peterson agree to participate." Peterson won both the International Boxing Federation (IBF) and WBA light-welterweight world titles when he defeated Khan in a split points decision in Washington DC. Khan initially appealed against the loss, citing concerns about points deductions by referee Joseph Cooper for pushing and also the judging of the fight. Then, earlier this month, Khan used his Twitter account to ask a series of questions over a "mystery man" seen at ringside talking to Michael Welsh, the WBA scoring supervisor, throughout the bout. The "mystery man" was subsequently named as Mustafa Ameen who attended the fight as a guest of the IBF but who had no official role in the fight. In an exclusive interview with BBC Sport last week, Ameen claimed he was only correcting mistakes and that Welsh was complaining of feeling unwell. "I noticed one error and a subsequent error. I assisted him in correcting it without touching anything," said Ameen. Both Welsh and senior WBA officials have declined to comment on the claims. Khan withdrew from an IBF appeal at the 11th hour last week, stating he thought the hearing would be "one-sided" given that "only partial representation of fight officials who were involved" in the initial contest would be present. The WBA have ordered that a rematch take place, believing there were "multiple irregularities" in the fight. Peterson is currently contesting that decision and the comments from his spokesperson make it clear he is not prepared to make a decision over his next fight until that process is complete. "We are confident the WBA will overturn its decision," Peterson's camp said in a statement last week. They also asked the WBA to "recognise Lamont Peterson as the true and final WBA light-welterweight world champion". However, the WBA's legal director Robert Mack has told BBC Sport that the appeal process is currently on hold as they seek clarification from Peterson's management over the nature of the appeal. Under WBA rules the 27-year-old American can apply for the judgement for a rematch to be simply reconsidered or he may request a formal hearing in which WBA officials can be requested to attend. The WBA ordered a rematch earlier this month, giving Peterson 180 days to agree terms with Khan for a new fight.